Dimension lumber is solid sawn wood that is less than 89 mm (3.5 in) in thickness. Lumber can be referred to by its nominal size in inches, which means the actual size rounded up to the nearest inch or by its actual size in millimeters. 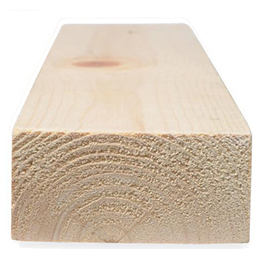 For instance, 38 × 89 mm (1-1/2 × 3-1/2 in) material is referred to nominally as 2 × 4 lumber. Air-dried or kiln dried lumber (S-Dry), having a moisture content of 19 percent or less, is readily available in the 38 mm (1.5 in) thickness. Dimension lumber thicknesses of 64 and 89 mm (2-1/2 and 3-1/2 in) are generally available as surfaced green (S-Grn) only, i.e., moisture content is greater than 19 percent. The maximum length of dimension lumber that can be obtained is about 7 m (23 ft), but varies throughout Canada. The predominant use of dimension lumber in building construction is in framing of roofs, floors, shearwalls, diaphragms, and load bearing walls. Lumber can be used directly as framing materials or may be used to manufacture engineered structural products, such as light frame trusses or prefabricated wood I-joists. Special grade dimension lumber called lamstock (laminating stock) is manufactured exclusively for glulam.